I grew up in a family owned radio station in Wichita, Kansas so from the time I did my very first commercial I knew that I wanted have my own radio show! I loved being able to connect with the audience, keeping them informed and of course the music! My radio career grew and eventually I landed in Houston, but when it was time to start a family, Tulsa was the place! It was beautiful…not crazy big, yet had so much going on. After working at a few radio stations here, being a Mom became my first priority and thankfully I was blessed to be able to do that full time. I’ve also spent recent years flipping houses, leading worship and working with my husband. But now I am in awe that once again I have the opportunity to be back in radio, ESPECIALLY at KXOJ, where I could not only do what I love but share my faith in Jesus Christ. How cool is that! My girls are amazing young women and my husband Jeff is the most incredible man in the world. He is a busy psychotherapist working with couples, singles and children. 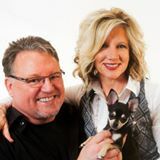 We love teaching and singing together, history, architecture, our children and our chubby Chihuahua, Belle Rindt. I am so thankful and excited to be with you and Dave in the mornings and thank you so much for welcoming me to KXOJ.